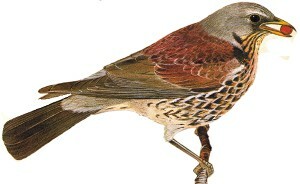 The Fieldfare is a large bird with blue-grey head, dark brown back and black spotted breast. In winter the birds underside is more white than orange-buff. Breeds in Northern Europe as a summer visitor and winters in Southern Europe. 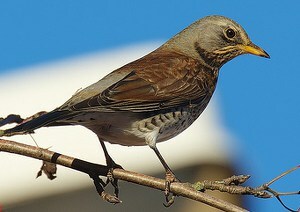 In the UK it visits in large numbers as a winter migrant. It has been known to breed in the UK but very rarely. In winter the Fieldfare is a bird of farmland orchards and hedgerows, in very cold weather it will visit garden bird feeders. A large strong bird which usually flocks in winter, often in the company of Redwing. The Fieldfare is particularly partial to apples and can be tempted by apple trees in gardens if the weather is very cold. The Fieldfare is a distinctive bird, the same size as a Mistle Thrush but with blue-grey head and rump, note the light flanks on this bird and the black tail.